The site of the former Twin Towers has, since 9/11, been known as Ground Zero, in an almost sacred way. The term predates 9/11 and has been used for the location of any major damaging or disastrous event, including earthquakes, tsunami and tornado touch downs. In military use it is therefore sometimes also referred to as surface zero. It is not to be confused with the military term zero point, which is the centre of a burst of a nuclear weapon at the instant of detonation. The zero point may be in the air, or on or beneath the surface of land or water, depending upon the type of burst. Although the term has often been associated with nuclear explosions and other large bombs, it is also used in relation to earthquakes, epidemics and other disasters to mark the point of the most severe damage or destruction. The term is also often used for disasters that have a geographic or conceptual epicentre. "For convenience, the term 'ground zero' will be used to designate the point on the ground directly beneath the point of detonation, or 'air zero'. " 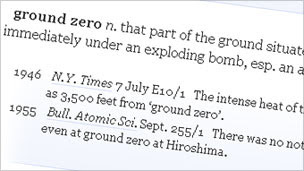 William Laurence, a reporter attached to the Manhattan Project, reported that "Zero" was "the code name given to the spot chosen for the atomic bomb test in 1945. The monument marking the hypocenter, or ground zero, of the atomic bomb explosion over Nagasaki. During the Cold War the Pentagon, the headquarters of the US Department of Defence in Arlington, Virginia was thought of as the most likely target of a nuclear missile strike. The open space in the centre is informally known as ground zero. A snack bar located at the centre of this plaza was nicknamed "Cafe Ground Zero". "The speech was about the future, about moving on and rebuilding Lower Manhattan. The name 'Ground Zero' is associated with the events of 11 September 2001 and the World Trade Center is part of the future." "Ground Zero means there's nothing there but now they're rebuilding and they've done a beautiful job, we need to forget it. I like 'The World Trade Center and September 11 Memorial'. It's more appropriate." - Ester Di Nardo, who lost her daughter Marisa in the attacks. "It has a strong national resonance but there's a strong case to be made for moving away from it. It's now a bustling site with buildings going up, but Ground Zero keeps it fixed to that moment when the towers fell. But you can't change language by edict. [The Mayor’s preferred term is] more symbolic, reflecting a particular perspective because he wants New York to be forward-looking."